I first heard about Anticuchos on a Chowhound thread about a new Peruvian restaurant here in Pacific Beach called Latin Chef. 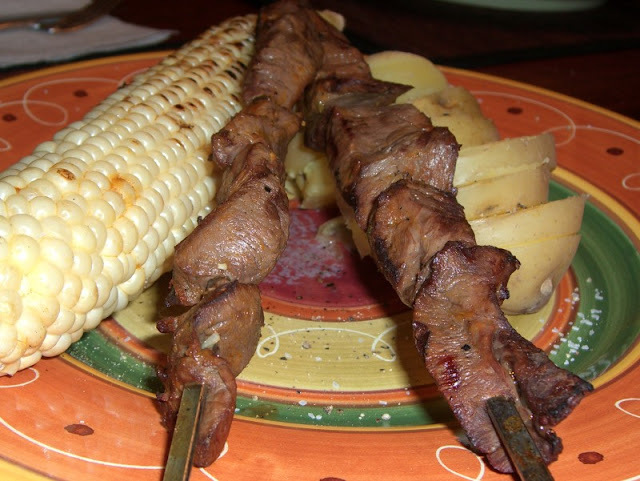 Anticuchos are grilled meat skewers, generally made out of beef heart and marinated using South American aji chilis. While shopping at Northgate market (a large, Mexican-centric supermarket), I happened across a jar of aji paste. 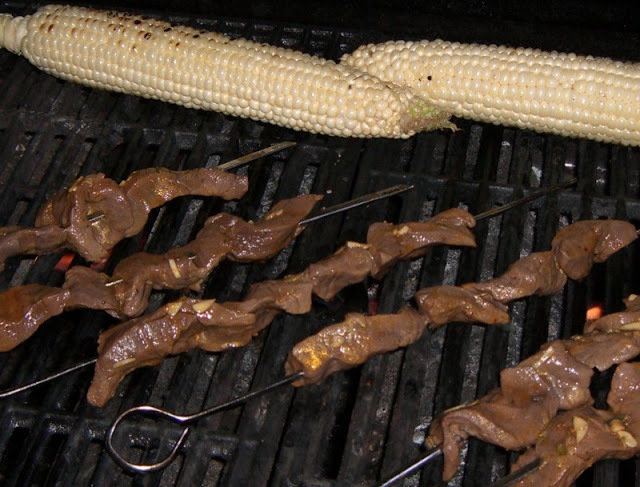 They also had nice looking beef heart, so anticuchos seemed destined to happen. 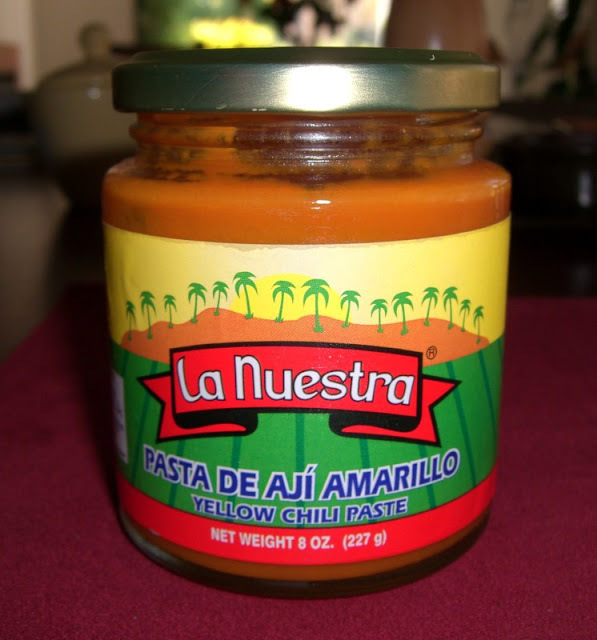 The Aji paste we bought is from Peru, and contains only aji amarillo chilis, water and salt. It smells awesome and is quite spicy. For the recipe, we mostly followed what we saw in this video from the Instituto de los Andes. There were numerous other recipes available online, some excluded annatto seeds, and marinade times ranged from 2 hours to 2 days, but all used a spicy chili paste, garlic, cumin, and plenty of vinegar. We marinated our beef heart about 10 hours (all day), grilled it with some corn and served it with simple, boiled potatoes. The meat came out medium-rare and had great texture. The flavor from the aji marinade was really nice. We are thinking of trying it on other kinds of meat -- maybe a nice flank steak. Trim beef heart well, removing all fat, valves and membranes. Slice into 1/2 inch thick pieces, about 1 inch wide and 2 inches long. Gently heat the annatto seeds in the oil 2-3 minutes, or until oil is colored red. Discard seeds, allow oil to cool. In a small bowl, stir the remaining ingredients together and mix well. Place the heart into a non-reactive bowl and pour the marinade over. Add the annatto oil and stir throroughly to evenly coat the heart pieces. Cover and refrigerate at least 8 hours or overnight. After marinating, thread the meat onto skewers. Cook on a hot barbeque grill, about 2 minutes per side, or until just cooked through (medium, not well done). Brush the meat with marinade several times while cooking. Serve with lightly grilled corn on the cob and simple boiled potatoes.